It’s pretty crazy that the spring is 2/3 the way done. Well, I’m actually not at all surprised because I’m used to life in upstate NY where the transition between winter and summer, what’s normally called spring, is a grey area. The swings in temperature are very manic at times, and it’s easy for the whole spring to whiz by while it’s either still cold and/or snowy or blisteringly hot. So there are a few weeks of spring left, and there are a bunch of events that are happening before we can officially ring in summer. Some are activities that are central to me and this blog, others have to do with my friends and cohorts and other things I think are worth your time. Here’s a reminder: you have about a week left to sign up for the cooking class I’m teaching at Different Drummers Kitchen. I have all the recipes typed out and will be ready to give you an entertaining and informative 150 minute class. I’ve jammed a lot of preparations into the session, I want to make sure you feel like you’re getting your money’s worth. I’ve taught chemistry in a similar group setting, and what I like about it is that it’s a very amenable environment for interactivity; I don’t want to talk at you, I want to talk with you and learn together. There’s going to be a little science, lots of cooking, and lots of fun. If you’re free on Tuesday, May 28 in the evening (6PM), I implore you to join us! I’ll be there in style! 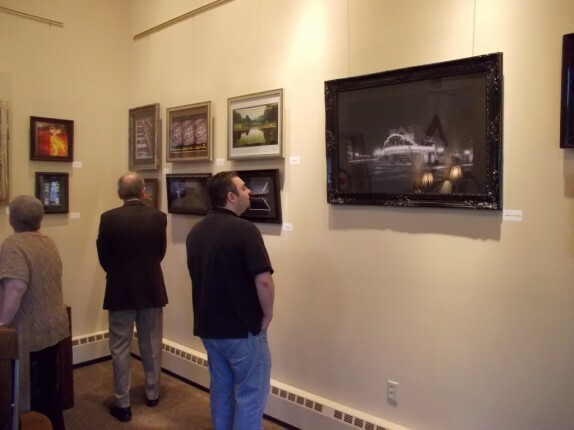 Another awesome thing going on is an art gallery put together by my friend, Chuck Miller. For this, you have until June 27 to check it out (details at aforementioned link). I’m going to emphasize the word “awesome” here, as it’s the best word I can think of to describe how stunning the images that Chuck has worked so diligently to prepare are. There is a lot of attention to detail that went into the exhibition, and, while the images will blow you away in person, the selection of frames and borders adds another layer to the absolutely fascinating imagery. My favorite is the centerpiece of the exhibition, Chuck’s award-winning “Midnight at the Palace.” I’m blown away by the image; the absolute darkness and the ethereal pops from the light is a really great contrast, and reminds me of some of my favorite Stanley Kubrick photography. Seriously, this is something you don’t want to miss. Remember about five months ago, there was a humble little fish shop called Fin that opened up in Star Plaza? Well, they’re having their grand opening celebration on June 1. I’m hoping to be able to stop by for a little while and check out all of the great things they have planned. If nothing else, use this event as an excuse to check out a truly superior seafood experience. The last reminder is that our 3 year party is fast approaching (It’s June 8 at Ted’s Fish Fry in Lansingburgh for those of you who don’t want to click links). I’m still actively seeking out things for the fun packs this year, so if you want to contribute, let me know. I’d be cool just about anything small, but I’m thinking things like artwork, trinkets, treats, or other fun items would be best. Think about it and let me know by May 31. Also, mark your calendar for June 8 at lunch time, because you’re not going to want to miss that.